After Lydia passes away from cancer, Rowan and his three adult children go to the family's vacation home in the English countryside to properly mourn Lydia, and to scatter her ashes during a private ceremony. However, shortly after their arrival, Sophie's baby daughter goes missing in the care of Felix's beautiful, but mysterious and mute new girlfriend, Kerry. As the rest of the story unfolds, it comes to light that a predator has been tracking members of the MacBride family for years, and is dedicated to ruining their lives as a result of not being accepted into Saxby Cathedral School years ago. 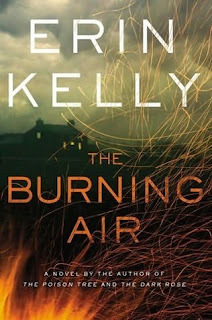 If you begin reading The Burning Air before really paying attention to its synopsis, you might think the book is about the troubling life of a middle-aged woman whose life spins into turmoil after her mother's death and on learning about her husband's unfaithfulness. After all, the book kicks off with events as seen from Sophie's point of view, and with no predator in the midst - yet. However, as you continue reading, you'll learn the novel is far from being about a middle-aged woman's breakdown. What The Burning Air is really about is the psychological downfall of a man whose misfortune has led him to blame and hold the members of the MacBride family responsible for his own shortcomings. The story unfolds in the most fascinating manner, and is mysterious up to the very end. Overall, The Burning Air is a very thrilling and engrossing read, and cleverly written. The first portion of The Burning Air - the "Sophie" portion - is, I admit, a bit of a snooze-fest. Before I managed to blow through the majority of the book in 2 days, it actually took me 2 weeks to get through the first 23 pages. But, once I reached the "Darcy" portion of the book, my experience with this novel became a full-speed-ahead roller coaster ride. For some odd reason, I read the majority of the Darcy portion thinking his character was a girl until I reached the part where he described himself as being a "self-made man" and on the prowl for a woman. Although I felt like a huge idiot (how could I miss something that big? ), I realized I was experiencing tunnel-vision in thinking Darcy was actually Kerry. Thank God my flippancy in no way ruined my experience with The Burning Air. Darcy's violent episodes throughout the book are few and far between, but scary enough to give readers a glimpse of just how crazy and obsessed his character becomes as a result of the MacBrides' dismissiveness. The one and only downfall of The Burning Air is its seemingly inconclusive and unfinished ending, but nonetheless, this novel is very well done, and will no doubt be well worth your time. Erin Kelly has also written The Poison Tree and The Sick Rose. Kelly's style has been compared to Tana French and Ruth Rendell. Have you read The Burning Air, and if so, what did you think? Share your thoughts with us in the comments section below.